SUN is a medium-sized star, which in astronomical terminology is called a yellow dwarf. The energy reaching the boundary of the Earth’s atmosphere is one half billion of the energy emitted by the Sun, and its stream has a power of about 1.39 kW / m2. As a result of reflection, absorption and dispersion, depending on the time of the day and the year, on average less than 50% of this energy reaches the Earth’s surface. The intensity of solar radiation on the surface of the Earth depends on the altitude of the Sun above the horizon, which is related to the thickness of the atmosphere layer through which this radiation is absorbed. The lower the Sun is, the thicker the atmosphere absorbs its radiation and the less solar energy reaches the Earth’s surface. 3. photobiochemical conversion (energy of chemical bonds) occurring in solid fuels (fossil fuels), crude oil and biomass. The basic element of a photovoltaic system is a photovoltaic cell that when exposed to solar radiation becomes a source of direct electric current. Photovoltaic cells are connected together in chains to form larger units known as modules or panels. 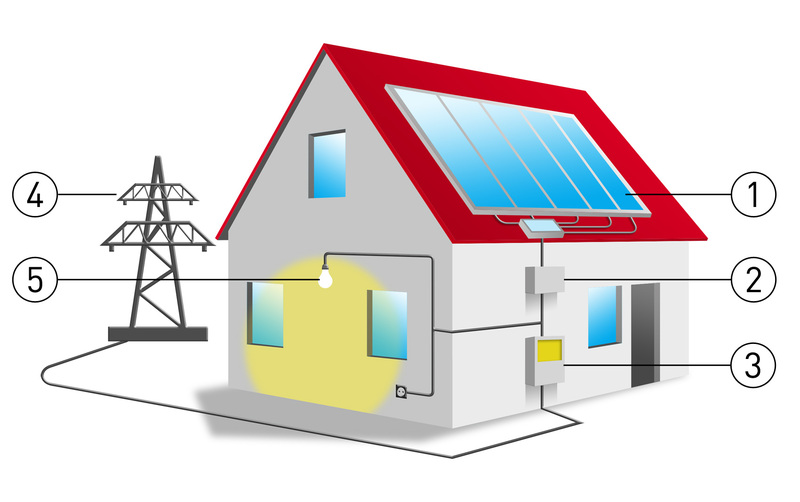 Photovoltaic systems generate direct current (DC), while most household appliances, as well as the local electricity transmission system uses the alternating current (AC). For this reason, photovoltaic systems consist of an inverter, which is used to convert DC into AC. When a solar system is connected to a local power grid, the surplus power that is generated by it can be fed back into the grid of the local electricity distributor. The advantage of this solution is that no energy storage devices are required. The most commonly used material for the production of PV cells around the world is silicon. The first generation technologies are based on crystalline silicon (mono- or multi / polycrystalline). Second generation technologies are based on thin film cells deposited on a relatively cheap substrate (eg. glass, polymer or metal). Their advantage is material efficiency and low price. Third generation photovoltaic systems are based on technologies such as CPV (Concentrated Photovoltaics, concentrating rays on the absorber), Gratzel DSSC solar cells (Dye-sensitized solar cells), or organic cells. Solar collector is the most popular solar energy conversion device. The housing of the collector is a steel or aluminum frame with a glass plate above the absorber (a plate absorbing solar radiation energy) and a layer of thermal insulation beneath it. The radiation coming through the glass plate of the collector heats the absorber, inside which there are channels with water or other liquid flowing through them. The glass plate does not allow solar radiation after passing through it to get back out, which gives the effect of the so-called radiation traps. The water heated in the absorber is directed to a tank with a heat exchanger by a pump. 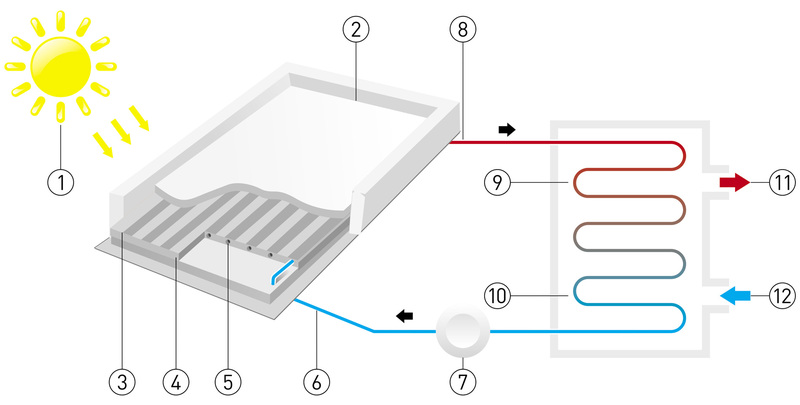 After heating, water from the tank is discharged to the heating system.